These pages work great when you are doing a displaced volume lab! 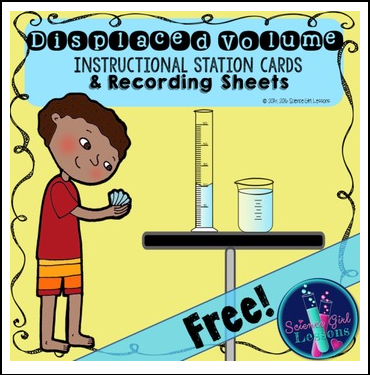 Grab various items (small enough to fit in a graduated cylinder) that are sure to sink and use displaced volume to find the volume of the items. The Station Instructions give students a step-by-step reminder of how to find the displaced volume of solid objects. The recording sheet will fit perfectly in an interactive science notebook and there is enough room on the chart for students to measure 10 objects. The recording sheets also break down the process to make it easier for you to see where common mistakes are. As a Texas teacher, the products I make are designed around the standards for the state of Texas, known as the Texas Essential Knowledge and Skills (TEKS) and are carefully crafted to help students be successful on the Texas STAAR test. I use the challenge of the TEKS and released STAAR assessments as models to guide me when putting together lessons and materials for my students. Thus, I am careful to post products that, in my judgment, align with these standards. I am not affiliated in any way with these entities and any and all claims of alignment are my claims, not those of the groups behind the TEKS or STAAR test. Please contact me if you have questions. Be sure to follow my TpT store by clicking on the green ‘Follow Me’ next to my Seller picture to receive notifications of my new products and upcoming sales. Khrys Bosland, for the use of her beautiful font in the clip art used. Copyright © Rebecca Valera. All rights reserved by author. This product is to be used by the original downloader only. Copying for more than one teacher, classroom, department, school, or school system is prohibited. This product may not be distributed or displayed digitally for public view. Failure to comply is a copyright infringement and a violation of the Digital Millennium Copyright Act (DMCA). Clipart and elements found in this PDF are copyrighted and cannot be extracted and used outside of this file without permission or license. Intended for classroom and personal use ONLY. Language Arts Lesson - "